Despite over-filling the massive city-issued recycling can every week, and sending just as much to the land fill, we have a lot of stuff. Stuff in the living room. Stuff in the bedrooms. And especially stuff in the garage. I’m not bragging. Actually, it’s obscene. It’s embarrassing. I’m pretty sure we could feed and clothe a few third world countries with the stuff that we have sitting around. And I’m not sure where stuff comes from. Does it multiply like a bad virus? Come out of the woodwork? 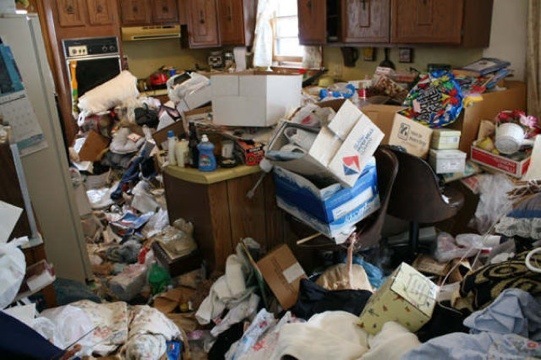 Or simply a bi-product of our lifelong hoarding habit? It's not quite this bad. But almost. What does that mean? Well, I’m thinking inside the box. By enforcing a zero-sum box game. In other words, for every box that comes into this house, the same box has to go out of the house within a week — filled with stuff — and donated to charity. So that’s the plan anyway. We’ll see how it goes. Got any better ideas?